With the vanishing of Team Liquid’s Tournament tracker, there’s been a noticeable diminishment of minor tournaments since the end of 2012 and the start of 2013. We spoke about the importance of minor [weekly] tournaments and opportunity for up-and-coming pro gamers in the article: Splitting the Scene for Regional Champions. As shown, the value and usage of these minor tournaments are quite attractive for many professionals, established or not. Back during 2010 and 2011, the number of major tournaments offering high prize-money was not as many or desirable as they are now (First place: 5,000$ from MLG, 6,500$ from IEM, 15,000$ from IPl: did not always include travel). Thus, the convenience of minor events being at-home as well as the return of payment notably raised the value of players exponentially, while also offering them experience and a variety of opponents both at their skill-level and lower (making tournaments a lot faster and not stretched across three-day periods [for weekly tournaments]). However, the diminishment of weekly and even minor tournaments could be signs of a changing scene. In Europe, major staples of weekly tournaments: GameCreds, Antec, IMBAlonian Star Cup, CraftCup, Alt-Tab Gaming Trophy. For America and South Korea, there are no more weekly tournaments whatsoever. Are weekly tournaments no longer valued or considered amongst teams and managers? Clarity Gaming: “Honestly, we weigh their marketability the most, as well as how they mesh with our team environment. After that it becomes more about results: we generally consider qualifier results the most important, with weekly tournament achievements somewhere after that. Major tournament results obviously come first. Right now, desire to come to the house is also a huge factor, we’re not nearly as interested in picking up a player that doesn’t/can’t come to the house. Ex-Quantic, Brad Carney: “When looking for the next big name player for our team we would probably look at skill first. There is a lot of skill but there are some people who just can’t “finish”. So people who could close out a tournament and have the confidence to do so would be priority number one. When looking for an up and comer, seeing who is winning a lot of dailies really helped. Time is also a huge factor. If someone doesn’t have the time either now or in the near future, it factors in on a decision.”. While pro gamers and aspiring players value weekly tournament organizations such as PlayHem’s Daily, ESL’s Go4SC2 and Xilence/Competo; few team managers account for it when interested in acquiring players. This is especially true in 2012 and 2013, where the accessibility of major events such as IPL and MLG are less costly to the player and team and more rewarding in terms of exposure and worth. Blizzard’s BWC, MLG Arenas and IPL’s Proleague all offered regional qualifiers as well as covering travel expenses towards anyone who qualified. This helped promote Koreans getting to foreign events while also ensuring North-Americans earn opportunities to achieve. This disproportion of value of weekly tournaments creates misunderstood notions of one’s own value. This may be held especially true for many players currently teamless such as ex-TSL Hyun who has a current asking price of 2,500 and travel to international tournaments. An arguably heavy toll for anyone considering this 53-first placed finishing pro gamer [plus 15-straight IPL Fight Club Showmatch victories]. This possible misbelief ultimately leads to players’ misunderstanding their real worth as well as constantly comparing themselves to players they beat and their salaries. While Hyun has an impressive winning streak in smaller tournaments and showmatches, his on and off record with the GSL as well as average placements in IPL, DreamHack and TSL4 lead managers to consider other potential rising stars (though, he has just been signed as of the release of this piece). Major events and LAN are accounted at a higher value than that of weekly tournaments and showmatches according to many team-managers (screenshot is courtesy of Liquipedia). Can the same be said for casters? I caught up with IPL’s Frank Fields [Mirhi] as well as NASL’s Dan Chou [Frodan] to get their view on the matter. Does casting tournaments , small or big, add to one’s resume as we first thought for players? NASL’s Dan Chou: “Weekly tournaments give an amazing platform for beginner casters for three reasons. One, they have the same audience — spectators who love the “homey” and personal atmosphere of the tournament which puts out enough consistent content to saturate their desires — on a consistent basis to practice their material on similar to stand-up comedians. Two, they have a high margin for error due to a loving low-count audience that endears the aspiring casters who work with little to no compensation. Three, they can build their own repertoire of history with local/semi-pro players for a storyline that main stage casters would not know if they were behind the same microphone. The answer was obvious in of itself. More experience and exposure, the better the caster can be, the more the public is aware of the commentator and the more aware organizations such as IPL and NASL are. This steady incline is not true for players however, who must divulge their time wisely between streaming/marketing, practicing builds and strategies and playing smaller tournaments for cash-prizes. Nonetheless, whether a caster or a player, the interest in weekly tournaments may be diminishing. As more and more weekly tournament organizations move on to new games and areas, the amount of money earned by players becomes more centered and emphasized on major tournaments and attendance. What direction will this mean about the separation between aspiring players, their result listings and the current established pro gamers? Will Heart of the Swarm merely continue this trend, emphasize the large events or will it revive the demand for minor tournaments, weekly competitions and create new reputations for new up-and-coming players? 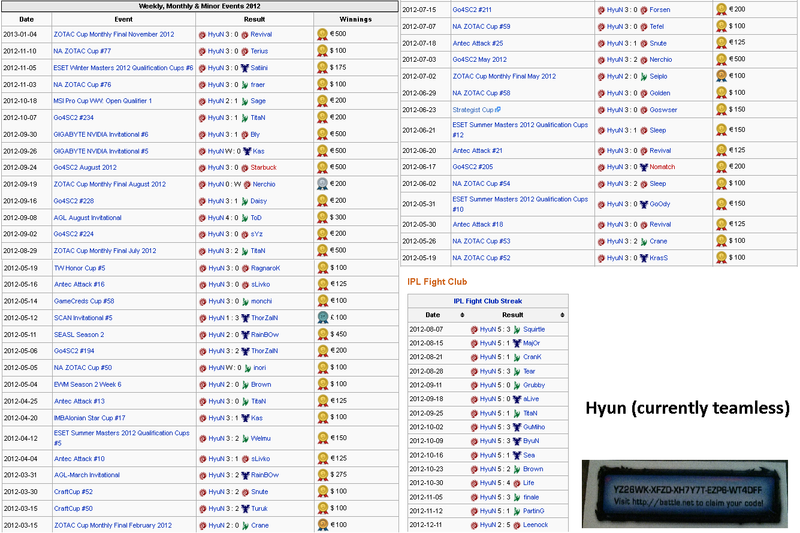 Nowadays, you need to do a “HyuN in IPL fight club” for weekly tournaments in order to get some attention. © 2019 Torte De Lini. All rights reserved.